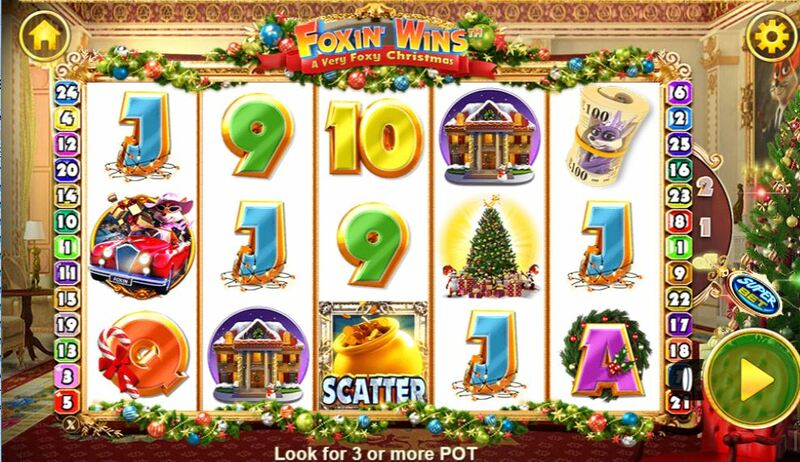 Foxin' Wins Christmas Edition slot is simply a copy of the Nextgen classic Foxin' Wins and not the sequel, Foxin' Wins Again. The scene is set with the reels against the backdrop of a posh living room decked out in all the Christmas decorations and finery and presents a very pleasant image it must be said. The omnipresent Fox annoys you when waiting to play by springing up and down on an armchair to the right of the reels but when he shuts up we hear some nice soothing seasonal music to complete the atmosphere the game intends. It's not unusual for developers to revamp games for the season of goodwill as Netent have done with both the Fruit Shop Christmas Edition and Flowers Christmas edition, so will our festive Fox deliver us some Christmas cheer for our bankroll? The Fox Pup in his inevitable Santa hat is our Wild appearing on all the reels of this 25-line game and will pay a seasonal 80x bet for a full line, with the Fox (again!) in his summer gear driving a red car for 40x, the house 20x, Christmas tree or banknotes 10x with six card values paying either 8, 6 or 4x for a 5-of-a-kind win. 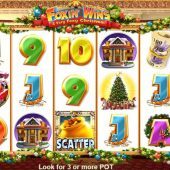 Like the original you can play 'Superbet' on Foxin' Wins Christmas Edition slot and instead of 25 coins can pay 35 for a Fox Pup to be added to the centre 3 reels and 50 coins for all the reels to increase winning chances, plus more are added during the free spins games. The extra Fox Pups will appear from behind any random symbol(s) on the reels. In both base game and feature spins. Before this, we do get a random feature whereby a Leprechaun may appear and the Fox will chase him. If he catches him you get 'Leprechaun Shakedown' rewards in the form of cash amounts he has on him. Should he escape you get nothing, but after any spin the Fox can appear on his own and throw coins out from his pot of gold for small cash awards. Speaking of the pot of gold, this is a scatter on the reels too and three anywhere in view trigger the final and best bonus! Having landed the three or more Gold Pots, you are given 10 free games which can be retriggered indefinitely and all wins are paid at a 2x multiplier. Now you'll notice there are a lot more Fox Pups appearing, plus more of the extra ones if you've used the Superbet facility. This can make for some nice surprises you'd love to see under your Christmas tree!